We have helped engineers, conductors, brakemen and maintenance-of-way workers employed by CSX Transportation, Norfolk Southern, Burlington Northern, Union Pacific and Amtrak, as well as Short Line railroads. The attorney you select is your agent, and his or her job is to represent you and protect your rights. Parsons & Associates, P.C. experienced FELA attorneys have successfully represented injured railroad workers for nearly twenty years. Seek medical attention immediately with a family doctor or specialist and not a doctor selected by the railroad. Do not give any recorded or written statements of what happened to any railroad claim agent. Call an experienced FELA lawyer as soon as you are able. Be aware of railroad surveillance of you and your home. Gather any witnesses’ names, telephone numbers and addresses right away. Save any work clothing, equipment, medical devices/braces, work papers or any other evidence to provide to your attorney. If possible, obtain photos and/or video of the scene and any equipment involved. Keep records of all medical providers and give this information to your attorney. Do not give the railroad a medical records release allowing it to call your doctor or obtain your medical records. When a railroad worker is injured on the job, the right to compensation is governed by a Federal law known as the Federal Employers’ Liability Act commonly called the FELA. The FELA became law in 1908 as a result of public anger over the devastating injuries and loss of life on the rails. The United States Supreme Court observed, “In 1888 the odds against a railroad brakeman dying a natural death were almost four to one; the average life expectancy of a switchman in 1893 was seven years.” Prior to the FELA, few of these workers or their families received any compensation for the injuries they sustained. The FELA was the first great social legislation of the twentieth century. Before the FELA, when an injured worker attempted to recover damages for the negligence of the railroad, the law was unfairly stacked against the worker. For example, if a worker was at all contributorily negligent, all recovery was denied. Even if the railroad was 99 percent at fault for the accident, and the worker only one percent contributorily negligent, there could be no recovery. 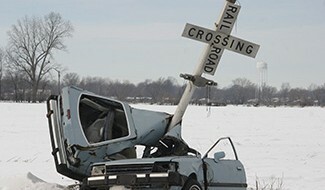 Incredibly, if a coworker caused an accident, an injured railroader could not recover from the railroad due to a defense known as “The Fellow Servant Doctrine.” And even when a railroad was blatantly negligent, it was frequently able to escape liability by arguing that the injured worker “assumed the risk” of employment. With the FELA, Congress established that injured railroad workers could sue for damages suffered as a result of the negligence of their employer in either state or Federal court. The Act abolished defenses like The Fellow Servant Doctrine and assumption of risk and eliminated harsh contributory negligence rules by substituting a comparative fault system. Thus, if a railroad coworker is partly responsible for an accident, his damages are reduced by his negligence. For example, if the worker has lost wages and pain and suffering of $100,000 and is 25% responsible, the recovery would be $75,000. In cases where the railroad violated a Federal railroad safety statute such as The Federal Safety Appliance Act or Federal Boiler Inspection Act, it would become strictly liable for all injuries resulting from that violation. In 1939, Congress improved the FELA by eliminating assumption of risk as an available defense in any situation, and making it a crime for a railroad to intimidate its workers from furnishing information about an accident to an injured railroad worker or his attorney. In the 1950s, a series of U.S. Supreme Court decisions further strengthened the FELA, liberalizing definitions of “cause” in the worker’s favor. Today, if railroad negligence played even a slight role in a worker’s becoming injured, the railroad will be liable. To recover under the FELA, it is necessary to first establish some negligence on the part of the railroad. This differs from state workers’ compensation laws where no such proof is needed. However, the amount of negligence that must be demonstrated is slight: essentially it must be shown that the railroad failed to provide a reasonably safe place to work. When railroads act negligently, recoveries under the FELA will generally be far greater than they would be under state workers’ compensation systems. Injuries resulting in permanent total disability under a state workers’ compensation systems will often result in a life of poverty for injured workers and their families. For example, in six states, the maximum permanent total disability benefits that are allowed under workers’ compensation fall below the current poverty level for a family of four. Workers’ compensation benefits tend to be fixed and arbitrary and grossly under compensate workers for injuries. The FELA, in turn, was intended to provide injured workers and their families with fair and liveable compensation for injuries. Not every case goes to trial. However, the FELA provides every railroad worker with the right to sue in state or federal court. The client controls the major decision-making in each case. After conferring with counsel, the injured worker can decide to accept a railroad settlement offer, make a different proposal, or go to trial. Our law firm has successfully represented employees from CSX Transportation, Norfolk Southern, Burlington Northern, Union Pacific, Amtrak and a variety of Short Line Railroads throughout the East Coast. Call today to speak directly to Michael for a confidential, no fee consultation about your FELA claim. He can be reached at 770-422-9000 or 912-650-3993. We offer personal service and all calls are returned within 24 hours.